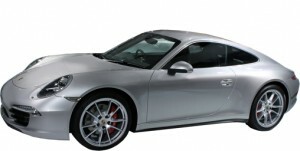 A new 911 Carrera GTS variant is added, above the Carrera S, but below the GT3 and the Turbo. It gets 30 more horsepower than the S, for a total of 430. This is the same engine that you can get in the Carrera S with the $17,800 Powerkit. Price has not been set; neither have the EPA mileage figures. Happily, it is available with a manual transmission, but only in rear-wheel-drive. 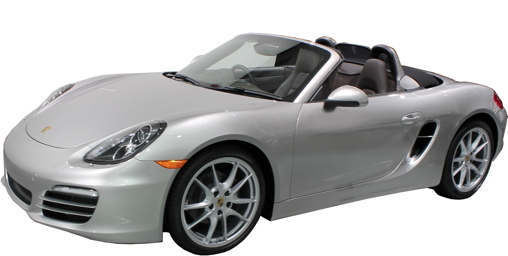 A PDK (Porsche dual-clutch automatic transmission) is available. A rear backup camera is now available on all models, not just the turbo. It must be ordered with front and rear ParkAssist, in a package that costs $1645. The largest tires: 245/35R20 front/305/30R20 rear, are now offered as an option on all models. LED headlights are also offered on all models now. Previously only offered on the Turbo and GT3. The big news is the highest performance Boxster, yet, the Boxster GTS, with its tuned 330 horsepower engine. It uses the same 13" front/11.8" rear brakes as the Boxster S, and it also offers the optional carbon fiber ceramic brakes with 13.8" rotors. For an extra $3680, you can get the "GTS Interior," with "GTS" script on the seat headrests and a sprinkling of carbon fiber trim. A Backup Camera, Porsche Entry and Drive and High Beam Assist become options across the lineup. The looks of the Cayenne get a mild tweak for 2015, but the lineup gets a major simplification and reshuffle, going from seven engines to four. Base model with 300 HP V6. GONE. Diesel. Unchanged, it becomes the new entry-level Cayenne. 240 HP. 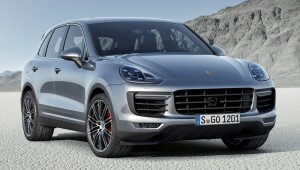 Cayenne S. 4.8 V8 is replaced by twin turbocharged 3.6 V6. Horsepower is up by 20. Torque is up by 37 to 406 lb.-ft. Fuel mileage is up 1 MPG city and 2 highway to 17/24. S Hybrid. Renamed S E-Hybrid. Total system horsepower and torque up significantly. Now 416 horsepower/435 lb.-ft. Now is a plug-in hybrid. GTS. The naturally aspirated 420 HP V8 is GONE. Automatic transmission, Xenon high-intensity discharge headlights, multifunction steering wheel (with radio and other controls), Full LED headlights are now optional, as are rear air conditioned seats. Lane departure warning is also offered, in addition to the Lane Change Assist (blind spot warning) previously available. Surround View is offered, giving a bird's eye view via multiple cameras. Built-in wireless access id available. SportChrono option now includes launch control, to maximize acceleration from a stop. Memory seats are now extra cost on Cayenne Diesel. They remain standard on other models. 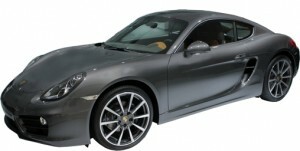 A GTS Cayman is also offered this year. With 340 horsepower from its Cayman S derived engine, the Cayman keeps its traditional edge over the Boxster. It uses the same 13" front/11.8" rear brakes as the Cayman S, and it also offers the optional carbon fiber ceramic brakes with 13.8" rotors. For an extra $3680, you can get the "GTS Interior," with "GTS" script on the seat headrests and a sprinkling of carbon fiber trim. Automatic switching high beams are offered as part of the Porsche Dynamic Light System Plus. A backup camera is no offered as an option with front and rear ParkAssist. This all-new, compact sport utility is under the Cayenne in the Porsche hierarchy. It shares architecture with the Audi Q5, in the way that the Cayenne and the Volkswagen Tiguan are cousins. 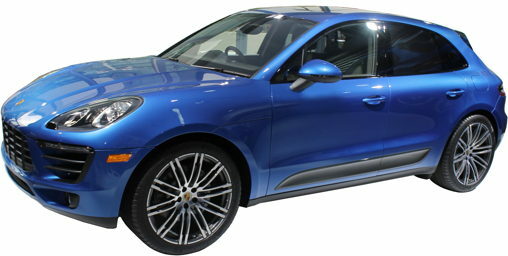 The Macan comes with two different turbocharged V6 engines: a 3.0 liter with 340 horsepower goes by the "S" label, and the 3.6 liter 400 horsepower model is called "Turbo." (Only slightly confusing.) As the Cayenne sells almost as well as all other Porsche models combined, the Macan is expected to do very well. Ceramic composite brakes are now optional, with a front diameter of 15.6 inches and a rear diameter of 14.6 inches. These brakes are larger than the wheels on the first Jeep. Refreshed for 2014, very little changes on the Panamera for 2015. 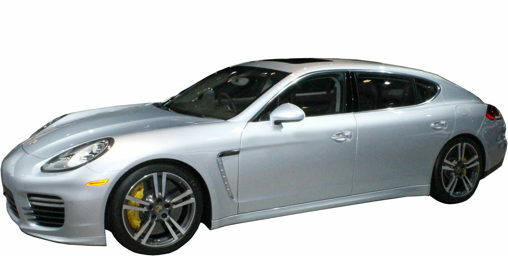 A Turbo S and Turbo S Executive were added to the mix as the new top dogs during the model year. With an extra 50 horsepower, for a total of 570, the "S" will cost you an extra $39,000. Satellite and HD radio is now standard.